The Global Volcanism Program has no activity reports for El Negrillar. The Global Volcanism Program has no Weekly Reports available for El Negrillar. The Global Volcanism Program has no Bulletin Reports available for El Negrillar. El Negrillar is a group of cinder cones and compound andesitic lava flows in what was interpreted to be a Holocene volcanic field W of the Cordón de Púlar (Moreno 1985, pers. comm. ; de Silva and Francis, 1991). Gardeweg (1993, pers. comm. ), however, did not consider it to be of Holocene age. This volcanic field, also known as Negros de Aras, lies ~20 km N of Socompa volcano. The major Holocene debris avalanche from Socompa overlies some youthful-looking lava flows at the W margin of the complex. The Global Volcanism Program is not aware of any Holocene eruptions from El Negrillar. If this volcano has had large eruptions (VEI >= 4) prior to 10,000 years ago, information might be found on the El Negrillar page in the LaMEVE (Large Magnitude Explosive Volcanic Eruptions) database, a part of the Volcano Global Risk Identification and Analysis Project (VOGRIPA). There is no Deformation History data available for El Negrillar. There is no Emissions History data available for El Negrillar. 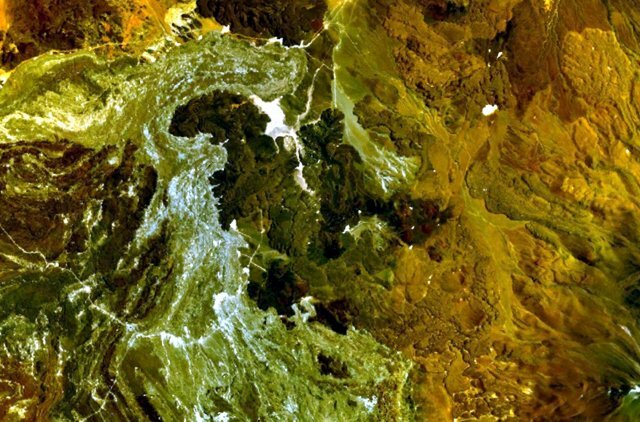 The dark-colored lava flows and cinder cones at the center of this NASA Landsat image (with north to the top) is El Negrillar. This group of cinder cones and compound andesitic lava flows of Quaternary age, also known as Negros de Aras, lies about 20 km north of Socompa volcano. The lighter-colored area on the left side of the image abutting El Negrillar flows on the west is part of the major Holocene debris avalanche from Socompa volcano. There are no samples for El Negrillar in the Smithsonian's NMNH Department of Mineral Sciences Rock and Ore collection. Large Eruptions of El Negrillar Information about large Quaternary eruptions (VEI >= 4) is cataloged in the Large Magnitude Explosive Volcanic Eruptions (LaMEVE) database of the Volcano Global Risk Identification and Analysis Project (VOGRIPA).